I realized that I should do this more often. Yesterday was a day with Nanay. (Nanay is the Filipino term for mother.) We wanted to watch Eugene Domingo's indie film. But to our surprise, the movie wasn't anymore showing in our favorite malls. :-( We instead went to SM Marikina and spent the afternoon together. After a tiring walk, I treated Nanay to Burgoo. It was her first time to try the restaurant. Food at Burgoo is quite pricey but they compensate in the amount of servings and extensive food selections. Aside from great good, their SM Marikina branch is my favorite because of the creative and modern interior design. The red and orange colors of the furniture make the place so alive and attractive. The wooden floor also balances the atmosphere by giving it a homey and classic look. Before I call it a day, I finally had the chance to see my nephew from my cousin. I wrote about him in this post. I finally saw the kid in person yesterday. Kenji has already returned to Japan and it would take months before I will see him again. I'm looking forward to see you in December baby boy. Be a good one ;-) And I hope on that month, I have accomplished something I will never regret. As I am writing this post, it's a Sunday and in a few more hours it would be Monday. I still have a lot of things to do. The research paper that would determine my fate on the next months is due on September. When will I able to finish my paper? Sounds like you had a great day with your Nanay. And your nephew....what a cutie! I'll look for him on the golfing circuit in a few years! I enjoyed seeing all of the photos in your last post too. It's nice to have older family photos. Have a great week (and good luck writing your research paper). What a great way to spend the day with your Nanay. 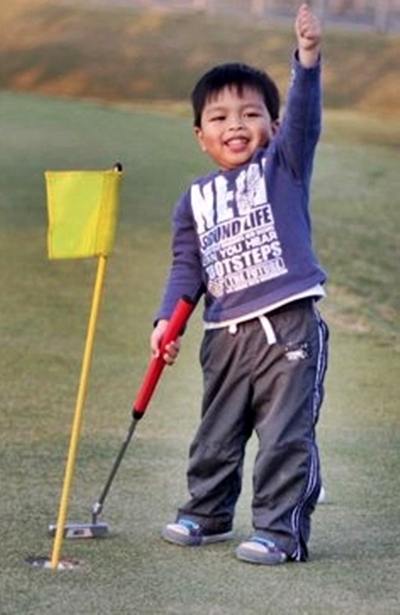 Your nephew sure looks like he's happy with a golf club in is hands:-) Keep up the good work with your research paper. Thank you so much for stopping by to enter my giveaway. I love Kenji! He's such a cutie!! Hey Diane! :D PS. I love libraries too! I can spend a whole day there.